Quiche are merry, oven-baked, open pie dishes of eggs and cream, wrapped snugly in a flaky pastry crust. Other ingredients, such as spinach, famously known as quiche florentine, or ham and cheese a la quiche lorraine, are often added. The crust is usually blind baked, but, as I lack the patience to do this, I skipped this fancy step and like the best Johnny Cut-Corners out there, I used phylo dough, roughly pressed into a tart dish. Most mornings I like to get up and go. One morning in particular, I felt like get up…and slow. A lazy day stretched out ahead of me with nothing to do. I decided to make myself an elaborate breakfast, just because. Quiche, I thought, sounds elaborate and glamorous and a perfectly perfect way to not start the rest of my day. Making pastry crust requires the patience of a jail sentence for life. I lack that patience. And in my first waking moments, where the world is still primitive, I shut off my brain and let my senses do the work: in a matter of minutes, had a perfectly hot, flaky and golden quiche quivering before me. 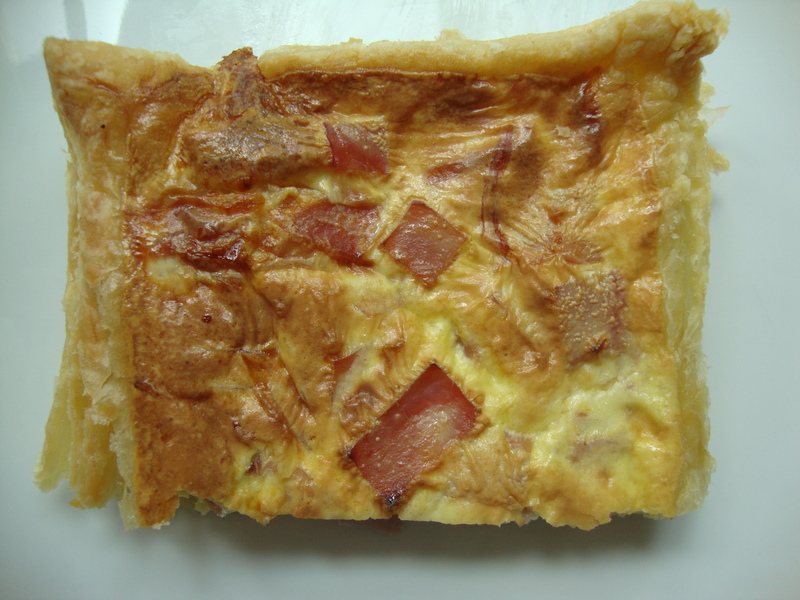 Quiche lorraine descends from the Lorraine region of France. 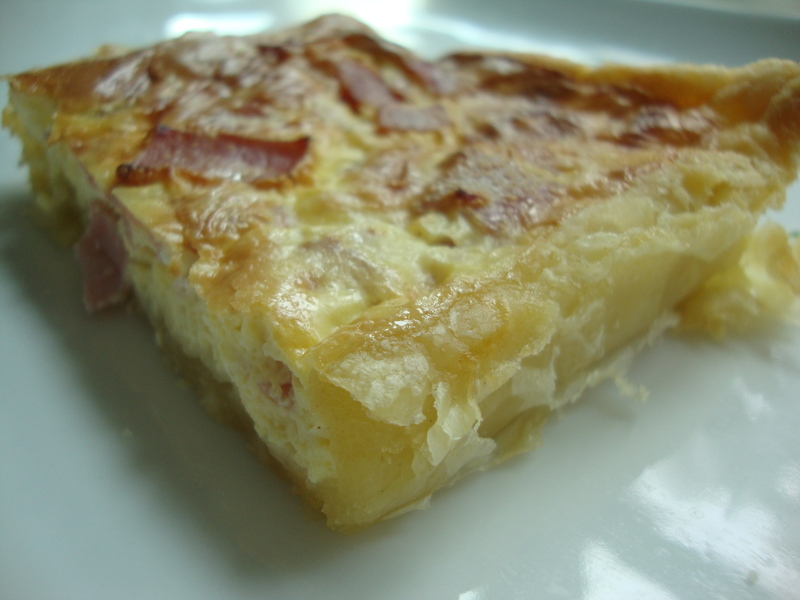 This particular brand of quiche combines eggs, cream and implies some type of meat, usually diced bacon or ham. Hardly formulaic, but extremely well-equipped for the American kitchen, where all these items are culturally staple, un, deux, trois, quiche! * these are rough measurements, as I sleepily tossed everything together and it all worked out. Press thawed phylo-dough in to a 9 X 3-inch square tart dish ( I used a metal tart dish and had to slice some of the dough to fit). Sprinkle cheese evenly over dough. ( I wanted to use gruyére, but due to limited cirumstances, I used the readily available mozzarella). Beat salt, eggs and cream together until well combined. Add ham. Pour egg mixture over dough and bake for 25-30 minutes, or until eggs are fully cooked and crust is golden.